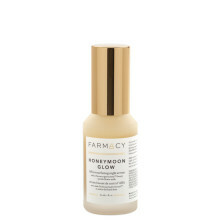 A powerful night serum that resurfaces skin and reduces the look of pores and fine lines, formulated with a 14 percent AHA/BHA/gentle flower acid blend to exfoliate and honey to hydrate. A first of its kind, this multi-correctional face serum is formulated with a 14 percent AHA/BHA/flower acid blend to resurface dull skin overnight and reveal a healthy, younger-looking complexion. Blend of AHA from lactic, glycolic, citric and fruit acids, and BHA from salicylic acid, reduce the appearance of pores, fine lines, and wrinkles. Flower acids act as gentle exfoliators, smoothing, and retexturizing skin. Perfect for all skin types, this formula is infused with Echinacea GreenEnvy™ honey and hyaluronic acid for intense hydration, ensuring skin never feels dry or stripped.